Drilling at the Sikasso property in southern Mali, West Africa. 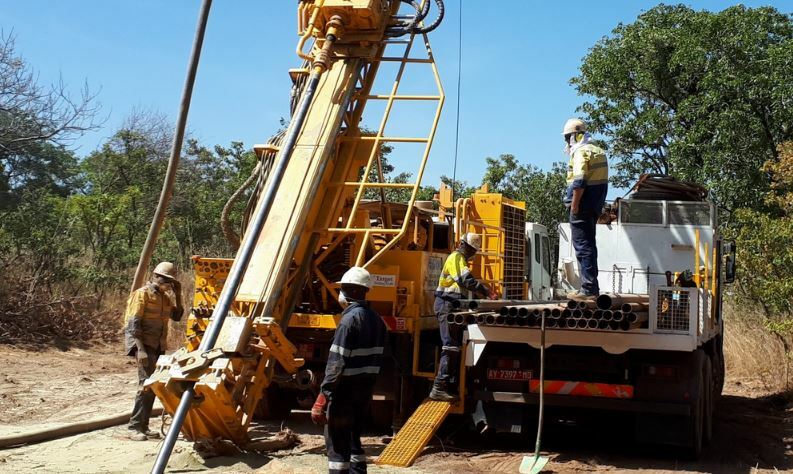 Source: Compass Gold Corp.
Compass Gold Corp. [CVB-TSXV; COGDD-OTC] shares skyrocketed Thursday March 28 after the company said drilling on the company’s Sikasso property in southern Mali, West Africa, has intersected high-grade gold mineralization. Investors reacted by sending Compass shares up 500% or 57.5 cents, to 69 cents on active volume of over 8.7 million. That put Compass among the most actively traded stocks on the TSX Venture Exchange on Thursday. The shares trade in a 52-week range of 10.5 cents and 74 cents. The Sikasso property consists of nine prospecting permits covering an area of approximately 850 km2 and is located in the Sikasso Region of the Republic of Mali. The property is divided into three permit blocks, including Yanfolilia North, Yanfolilia South and Kale. The Yanfolila North block consists of the adjoining Farabacoura and Ouassada permits, and the non-contiguous Sankarani permit, and covers an area of 254 square kilometres. All permits are owned by Compass’s subsidiary Mali Gold Exploration Pty Ltd. (MGE). The properties in the Sikasso Project are considered prospective for orogenic gold-style mineralization, based on their favourable Paleoproterozoic geology and structure, including their proximity to other mineralized systems in the area. The Ouassada, Sankarani and Kouru permits contain several historic surface showings and artisanal alluvial and eluvial mines. Modern exploration, using a variety of techniques such as soil geochemistry, lithogeochemical prospecting and airborne geophysics resulted in the identification of additional mineralization, which has subsequently been worked by artisanal miners at several localities. Bedrock mineralization has been identified on the Ouassada and Sankarani permits, and consists of decimetre-wide quartz veins with pyrite. The average gold concentration of 342 artisanal pit samples collected from two prospects at Ouassada (Farabakoura and Kabangue) was 3.11 g/t gold, with a large standard deviation of 6.99 g/t gold, which reflects the “nuggety” nature of the gold. Independent sampling of bedrock and eluvial mineralization on the property confirmed the previous measured gold concentrations. Thursday’s stock market rally came after the company released an update on the results of one diamond drill hole completed on extensive artisanal workings at the Ouassada permit. Highlights include the identification of three discrete mineralized zones with an 18-metre wide interval that assayed 4.0 metres at 83.82 g/t gold (from 63 metres), 4.0 metres at 7.04 g/t gold (from 69 metres) and 3.0 metres at 4.18 g/t gold (from 78 metres). The company said a 1.0-metre interval (with a 45-cm true thickness vein) contained 329.92 g/t gold. Compass is now planning a 1,000-metre drill program at Farabakoura to test additional targets. “The results from our first diamond drilling thus far at Farabakoura are exceptional,” said Compass CEO Larry Phillips. “While the 330 g/t gold interval reflects the nugget nature of the gold, it is important to note that the three mineralized structures around it correlated with what we found in adjacent RC holes drilled in December,” he said. “Looking at the larger picture, we also see that the mineralization drilled to date a Farabakoura is coincident with structures identified from our ground geophysical surveys.” Phillips said the company is looking forward to starting to further drill test these trends soon, which are up to 1,600 metres in length, to determine the full extent of the mineralization in this highly prospective portion of the company’s permits.